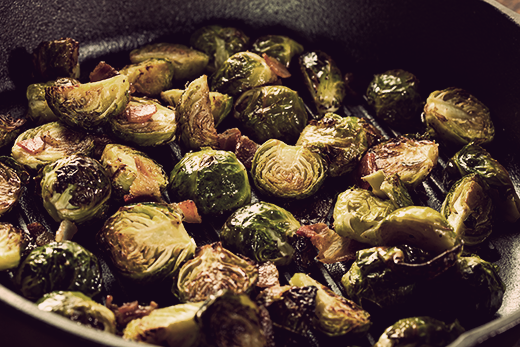 Did you know that Brussels sprouts are a common side dish for Thanksgiving? That begs the question: How do you make Brussels sprouts into a tasty appetizer or side dish? The answer: Add apple and prosciutto of course! 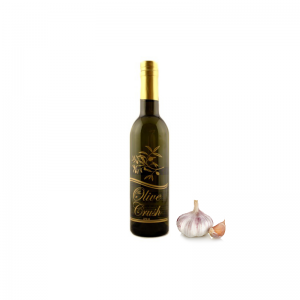 Over medium heat, sauté onion and garlic in Chipotle Olive Oil and Garlic Olive Oil until soft and golden and avoiding to burn the garlic. Add prosciutto, apples, and thyme, and cook until prosciutto is slightly crispy and the apples are caramelized. Add the Brussels sprouts and season with salt and pepper, to taste. Cook until tender and slightly golden, but still nice and green. Toward the end of cooking, add the Red Apple White Balsamic Vinegar and allow everything to come together and glaze over. 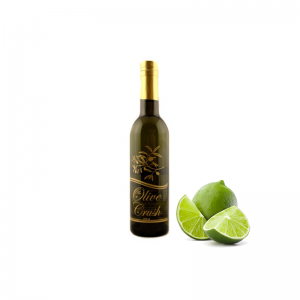 After plating, add an extra drizzle of Chipotle Olive Oil and Garlic Olive Oil to bring out some extra flavor. This Greek inspired brined turkey with greek yogurt and dill is drizzled with our California Mission Olive Oil and roasted to perfection. Sure to be a delicious addition to your Thanksgiving! In a large stock pot, combine the water, sea salt, mint, coriander seeds, thyme, dill, honey and garlic cloves. Bring to a boil, and stir frequently to be sure salt is dissolved. Remove from heat, and let cool to room temperature. When the broth mixture is cool, pour it into a clean 5 gallon bucket. Stir in the ice water and Ouzo. Place the turkey, breast down, into the brine. Make sure that the cavity gets filled. Place the bucket in the refrigerator overnight but no longer than 12 hours. Remove the turkey and carefully drain off the excess brine and pat dry. Discard excess brine. Preheat the oven to 425. Arrange an oven rack on the lower third of the oven. Place the turkey in a roasting pan on a rack. Tuck the roasted garlic cloves in the cavity of the bird along with the lemon. 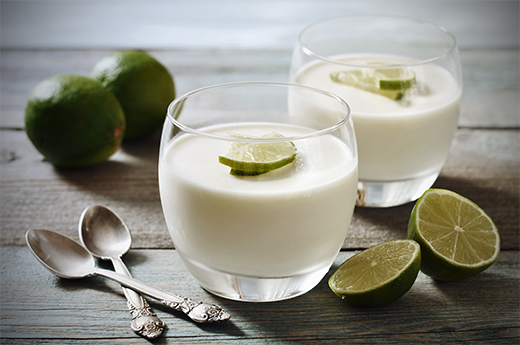 Mix the yogurt with the chopped dill and coriander. Season with salt and black pepper. Take your hand and loosen the skin from the breast. 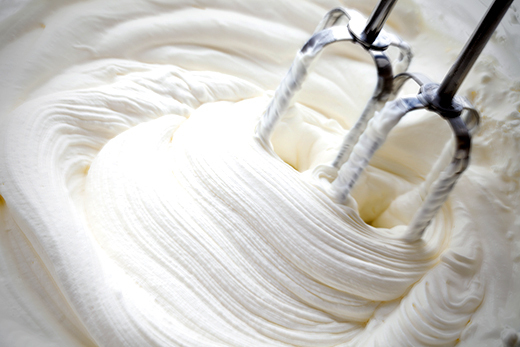 With a piping bag, gently distribute the yogurt mixture under the skin of the turkey, in the cavity, and on the turkey skin. 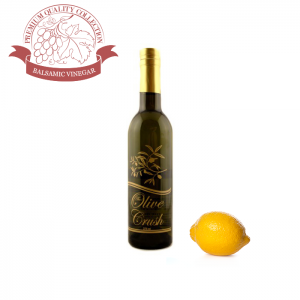 Drizzle California Mission Extra Virgin Olive Oil over the turkey and place in the oven. Cook for about 30 minutes, and then reduce the oven temperature to 325. 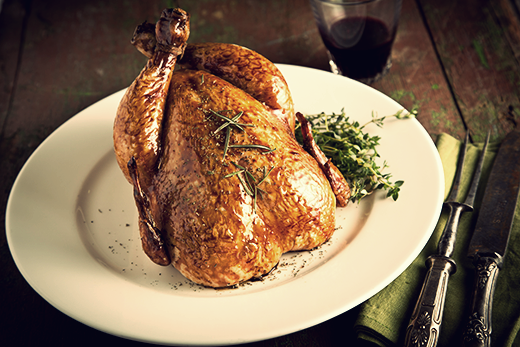 Continue cooking until a thermometer reads 160 degrees F when inserted into the thickest part of the thigh. Let the turkey rest for 20-30 minutes before carving. In a small sauce pan, add the stock, dill, turkey drippings, and lemons. Bring to a simmer and slowly whisk in the eggs. Do not boil or the eggs will scramble. Adjust the seasoning with salt and pepper. Searching for a new way to prepare an old holiday favorite? Try this Sweet Cinnamon Holiday Ham recipe with a glaze made from our delicious Cinnamon Pear Balsamic Vinegar. With a sharp knife, score the fat all over the ham in a diamond pattern. Place it, cut side down, in the roasting pan and cover tightly with foil. Bake for 1 hour. 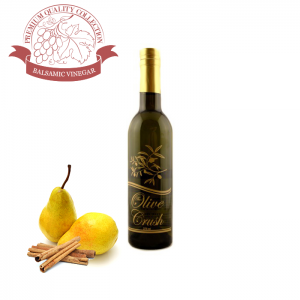 Meanwhile, reduce the Cinnamon-Pear Balsamic Vinegar to 1/2 cup by gently simmering in a medium saucepan, set over low heat. This process should be done slowly, taking approximately 25-30 minutes to complete. When the Balsamic has become thick and syrupy and is reduced by half, remove from heat. Whisk in the Dijon mustard. 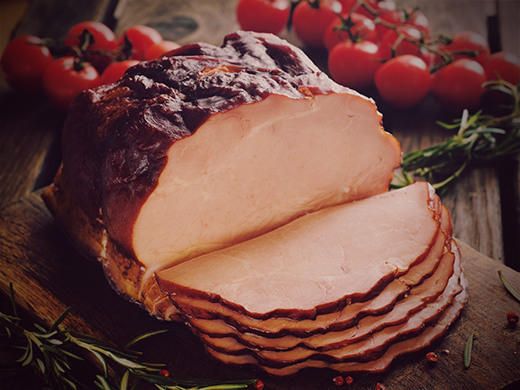 After baking for an hour, remove the ham from the oven and increase the temperature to 350ºF. Using a pastry brush, liberally apply the Cinnamon-Pear Balsamic Vinegar glaze all over the ham, paying special attention to working it into the scored portions. Covering just the shank end with a small piece of foil to prevent it from burning, return the uncovered ham to the oven and roast for approximately 35 minutes, or until the glaze has caramelized and the ham is golden brown. Without stuffing, Thanksgiving dinner is just a turkey meal. 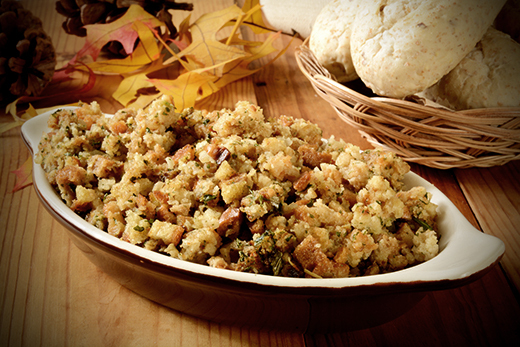 Try this deliciously flavored stuffing using our California Mission Olive Oil and Whole Spice Chicken Stuffing Seasoning, and some unique ingredients like pumpkin and pears! Heat 2 tablespoons of the olive oil in a large saute pan over medium heat. Add the bread cubes and saute for 5 minutes, or until golden brown. Remove from the heat and set aside. Heat the remaining 2 tablespoons of olive oil in a large Dutch oven or other large pot over medium heat. Add the garlic and shallots and saute until golden, about 5 minutes. 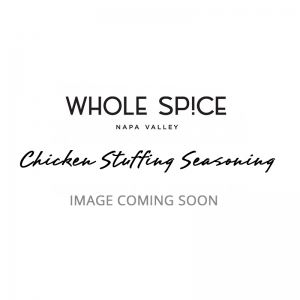 Add the pumpkin, quinces/pears, cinnamon sticks, and Chicken Stuffing Seasoning and saute another 5 minutes. Stir in chicken stock, orange juice, and honey, reduce heat to low, and simmer until pumpkin is tender, about 15 minutes. Add the thyme, salt, and reserved bread cubes. Cook over low heat, stirring frequently, until heated through, about 15 minutes. Remove cinnamon sticks and stir in the parsley. 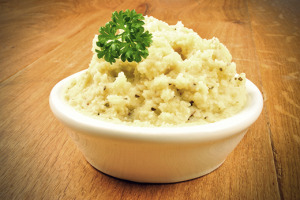 Add a little flavor to your Thanksgiving meal (or any dinner meal) with these herb mashed potatoes with olive oil as a healthy alternative to butter or margarine. These delicious potatoes can be served with or without gravy. In a large saucepan, combine the potatoes, 1 teaspoon salt, and cold water to cover. Bring to a boil over high heat. Lower the heat to maintain a simmer and cook until potatoes are fork tender (about 10 minutes). Drain the potatoes, reserving 1/2 a cup of the cooking liquid. Return potatoes to the pan. Shake the pan over medium heat for about a minute to dry the potatoes then transfer to a food mill, ricer, or bowl. 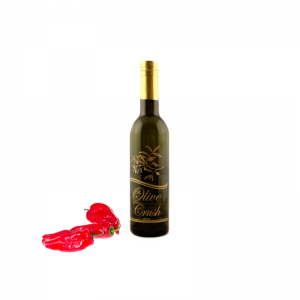 Add the Arbosana Extra Virgin Olive Oil and reserved cooking liquid to the saucepan, and warm over medium heat. Once warmed, remove pan from the heat. Mash the potatoes through the food mill, ricer, or by hand into the pan. Add the Whole Spice Herbs De Provence Seasoning, and parsley and stir to combine. 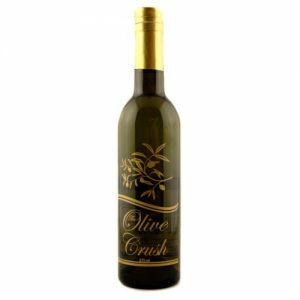 If you're looking for a more buttery flavor, try this recipe with our Natural Butter Flavored Olive Oil instead of the mild Arbosana. 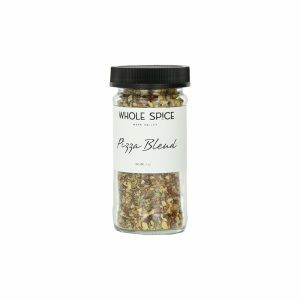 This a mixture of the herbs that flourish in the hills of southern France during the hot summer months. Used in handfuls when fresh, they can also be dried for use until the next season. 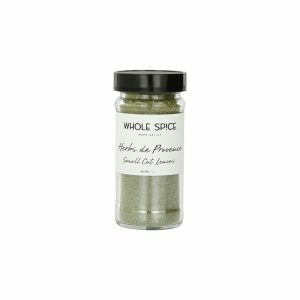 Herbs De Provence is a useful addition to any dish from the Mediterranean region and is especially good in stews, with baked tomatoes or roast chicken, added to pizza toppings, or sprinkled over kabobs before broiling. Ingredients: Basil, Thyme, Savory, Rosemary, Tarragon, Lavender, Fennel. A combination of two American favorites: pizza and popcorn! Using healthy extra virgin olive oil and the Whole Spice Pizza blend, this amazing take on flavored popcorn will leave you wondering why you didn’t think of it sooner! 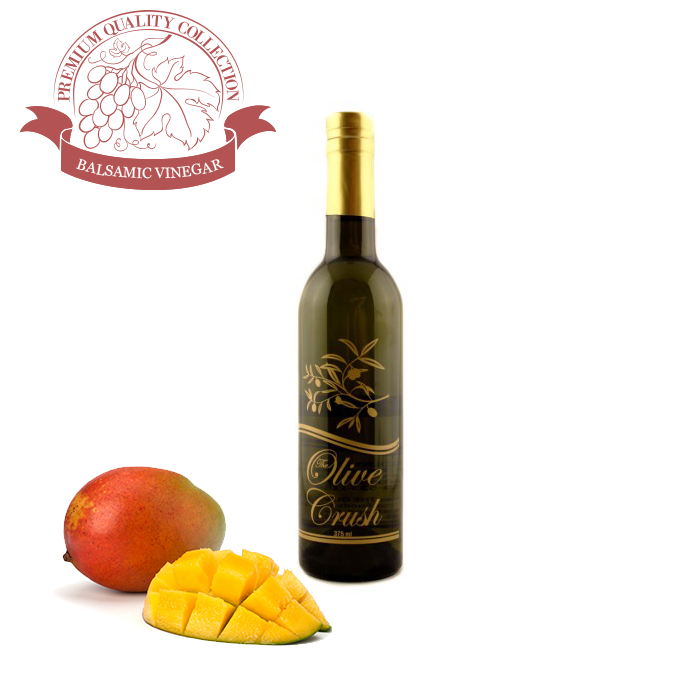 Pour the Hojiblanca Olive Oil and popcorn into a heavy, deep pot. Place over medium heat, cover and shake, moving the pot constantly. Continue cooking the popcorn until the popping slows down, about 3-4 seconds between the pops. When done, pour into a medium-sized bowl. 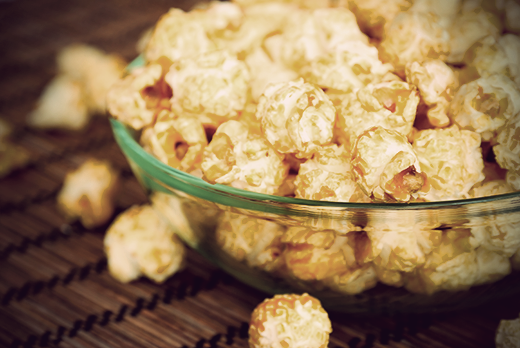 Drizzle the Hojiblanca Olive Oil over the popcorn and shake to mix until the popcorn is coated. Sprinkle with Whole Spice Pizza Blend and Parmesan cheese. Shake bowl or mix with spoon to distribute. Make it light! Use an air popper for the kernels and cut back on the olive oil and cheese for the topping. 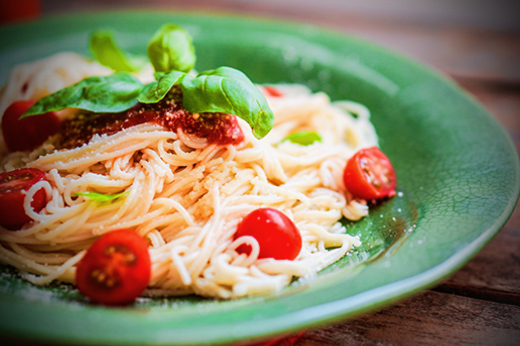 A tasty pasta classic using our Italian Leccino Olive Oil and Aged Balsamic Vinegar. The perfect family dinner! Add angel hair pasta and cook for 3 minutes or until al dente; drain. Pour Leccino Olive Oil in a large, deep skillet over high-heat. Saute onions and garlic until lightly browned. Reduce heat to medium-high and add tomatoes, 18 Year Old Traditional Balsamic Vinegar and chicken broth; simmer for about 8 minutes. Stir in red pepper, black pepper, basil, and cooked pasta; tossing thoroughly with sauce. Dark chocolate balsamic vinegar is not only great for baking, pancakes, and ice cream, try it in this amazing Strawberry & Avocado Salad. This salad is great for those in search of a way to make a lunch staple new and exciting. Mix together Dark Chocolate balsamic vinegar, Arbequina Olive Oil, cacao powder, and salt. Thin to your desired consistency with water. The cacao powder may not dissolve very well, but that won't affect the flavor. 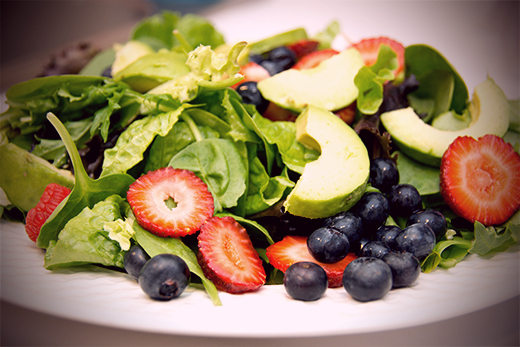 Plate the salad mix and top with strawberries, avocado, and mint. Add almonds and cacao nibs just prior to serving. Try this with 1 cup of blueberries for some extra sweetness!